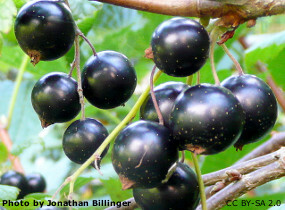 BLACKCURRANT, BEN LOMOND (Ribes nigrum Ben Lomond). Fruit. Late frost resistant blossom. Large good flavoured berries, freezes well. Mildew resistant. Heavy cropping. Compact habit. Self-fertile. 2 year bushes. Plant 5ft (150cm) apart.